A police couple has died in a fire alongside their daughter and a constable in an Adamawa State community. According to a Punch Metro report, a police Inspector, identified as Bobbo, his wife, Sgt. Grace, their daughter and a constable have been burnt to death in an early morning fire at Karewa Police Barrack in Yola. 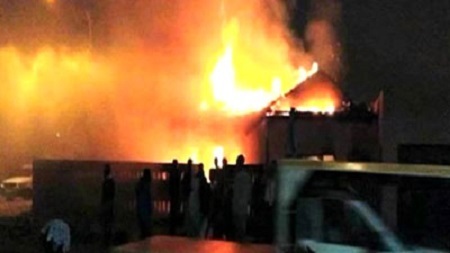 The Adamawa Command Public Relations Officer, Othman Abubakar, said the incident occurred around 1:00 am and the cause of the fire is being investigated. “Inspector Bobbo, his wife Sgt. Grace, their daughter and a newly recruited constable who is a relation that is squatting with them were all killed in the unfortunate incident,” Abubakar said. Some residents of the barracks said efforts to put off the fire and rescue the victims were not successful due to the burglarproof in the house. “Many people have installed burglarproof due to petty thefts being experienced in the barrack,” a female resident who spoke under anonymity said. Meanwhile, Adamawa Deputy Governor, Mr Martins Babale has visited the barrack to sympathize with the residents over the incident.